This easy level trek can be undertaken all year long except during monsoons. The trek begins at Barsu, taking you through oak and pine forests, up to an altitude of more than 10,000 feet above sea level. You’ll see famous peaks like Kala Nag, Bandar Poonch, the Gangotri Massif I and II, and many more. You'll have plenty of time to explore the place and soak in the beauty. • Take an easy trek Dayara Bugyal and get stunning views. • Camp in some of the most beautiful meadows in Uttarakhand. • Trek through forest routes and flower-filled meadows. Travellers are required to follow instructions of the trek leader during the trek to Dayara Bugyal. 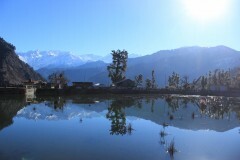 For cancellations made 30 days or more before departure of the Dayara Bugyal trek: 100% refund. For cancellations made 15-29 days before departure of the Dayara Bugyal trek: 50% refund. For cancellations made less than 15 days before departure of the Dayara Bugyal trek: no refund. All refunds will be processed after deducting the cost of any travel or accommodation bookings already made by the tour operator. A basic level of health and fitness is required to book this trek to Dayara Bugyal. If you have any cardiac or respiratory conditions, or suffer from knee or spinal problems, please inform the tour operator and consult your doctor before booking this trip. Travellers can offload their luggage to personal porters/mules at an additional cost of INR 300 per day, per bag not exceeding a weight of 12 kgs. Travellers can rent trekking shoes for an additional cost of INR 200 per trekking day, and a walking stick for an additional cost of INR 50 per trekking day. Once rented, charges will be applicable irrespective of whether the item is used or not. The tour operator reserves the right to cancel or alter the itinerary of the trek to Dayara Bugyal to ensure maximum safety for travellers as well as staff. On the 6-hr drive from Dehradun to Barsu, you'll cross tiny but charming towns. Barsu is a quaint little village, and a bird-watcher’s paradise. From here you trek for a few hours above the village to reach a small lake called Barnala Tal. Look out for the famed black eagle on this trek. Overnight at Barnala Tal in tents. 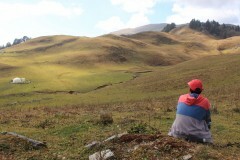 Start on the trek to Dayara Bugyal, which passes through Barnala Bugyal. This 4-km trek through tree-lined stretches offers spectacular views of snow peaks. Spend the rest of the day at leisure, exploring the serene and peaceful grasslands and mountain views from the campsite. Overnight at Dayara Bugyal in tents. You'll bid adieu to the gorgeous landscapes of Dayara and descend to Barsu. It is a downhill trek throughout and you should reach the road head at Barsu in the afternoon. You'll be driven to Dehradun from here, to arrive by late evening. Your trip ends here. Overnight at Barnala Tal in tents. You'll be accommodated in tents at Barnala Tal on twin/triple-sharing basis. Today's meal package includes dinner only, served upon arrival at Barnala Tal. However, you may stop at any of the restaurants or eateries en route to have meals at and additional cost. You'll be accommodated in tents at Dayara Bugyal on twin/triple-sharing basis. Today's meal package includes breakfast, lunch and dinner. Lunch may be a packed lunch, served while trekking. Today's meal package includes breakfast and lunch only. However, you may stop at any of the restaurants or eateries en route to have meals at and additional cost. The tour operator will arrange your transport to the start point of the trek to Dayara Bugyal.